Perhaps sensing that Democrats are gaining traction, Trump has decided to go on the attack, targeting the Democratic proposal known as "Medicare for All." Trump's figure was calculated by the libertarian Mercatus Center, but he fails to note that total health care spending under Medicare for All would be about $2 trillion less over the decade than currently projected. The federal government would pay more, but Americans on the whole would pay less. President Trump is attacking Democrats over a plan to expand Medicare to cover all Americans. In an op-ed published today in USA Today, Trump says the Democrats' plan would hurt seniors. He made a similar claim last night at a campaign rally in Iowa. 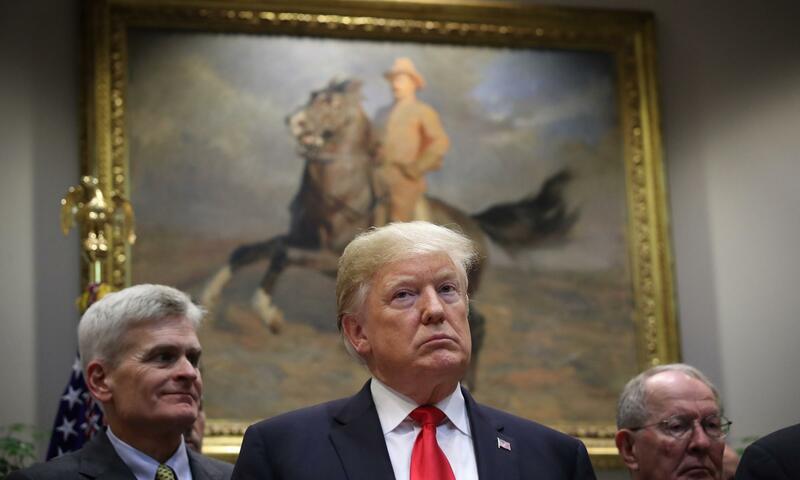 PRESIDENT DONALD TRUMP: A majority of House Democrats have already signed up for a socialist health care plan that would obliterate Medicare and eliminate Medicare Advantage for 20 million seniors. CHANG: All right. Fact-checkers have challenged the president's claims. And one of those fact-checkers is our very own Scott Horsley, who joins us now to set the record straight. Hey, Scott. CHANG: So we are just weeks away from the midterms now. Democrats are talking a lot about health care, too. Both sides are clearly focusing on this issue now. HORSLEY: They are, Ailsa. You know, health care is an emotional issue. It taps into people's fears and vulnerabilities. It also taps into our pocketbooks in a big way. So it has long been a potent issue for mobilizing voters, especially older voters who are more likely to show up at the polling place. In the past, Republicans have campaigned against Obamacare. This year, Democrats think it's their turn. They're campaigning against GOP efforts to repeal Obamacare. Fully half of the Democrats' campaign ads have been devoted to this issue. Here's Senate Democratic leader Chuck Schumer. CHUCK SCHUMER: There is one issue above any other that is going to define the results in the November 6 election, and that is health care. HORSLEY: And President Trump is apparently also sensing the political power of that argument. So he's mounting a counteroffensive with this critique of Medicare for all. CHANG: So what is Trump saying about that program in particular, this idea, basically, of letting everyone get Medicare instead of having to pay for private insurance? HORSLEY: The first thing the president says in his USA Today column is that it would carry an astonishing price tag - $32.6 trillion over a decade. Now, that sounds like a lot of money, Ailsa, and it is, but what the president leaves out is some important context, which is that our current health care system is on track to pay even more than that. We already have the costliest health care system in the world. And if you count tax breaks for the insurance that workers get on the job, the federal government already foots about two-thirds of the total bill. But we're not getting any of the efficiencies or the buying power that would come from replacing private insurance with a single-payer system. CHANG: And how does the president explain why shifting to a single-payer regime would hurt senior citizens? HORSLEY: He argues that Medicare for all would lead to rationing, that doctors and hospitals would be put out of business, that seniors would lose control of their health care. But he offers no evidence for those claims. He really seems to just be playing on generational fears that any effort to boost health security for younger Americans has to come at the expense of their seniors. CHANG: OK. But realistically, what are the prospects ultimately for Medicare for all? HORSLEY: Even if Democrats win in November, they're not going to have the power to pass Medicare for all over the president's certain veto. And like Obamacare and GOP plans to replace Obamacare, Medicare for all might not look so shiny and bright when you actually have to debate the details of the plan. HORSLEY: But if we're going to have that debate, Ailsa, it's probably useful to do so with facts, not fear. And, unfortunately, the president's op-ed column today doesn't really contribute to that. CHANG: OK. Finally, the president has repeatedly said that he has kept his promise to protect people with pre-existing conditions. Is that true? HORSLEY: He has made that promise repeatedly, but, in fact, he and his fellow Republicans have tried to unwind the protections in Obamacare. And they've proposed replacing them with unspecified state-level guarantees. The insurance industry has warned that could destabilize the market, create a patchwork of state regulations and raise prices for older, sicker Americans. CHANG: That's NPR's fact-checker, Scott Horsley. Thank you, Scott.